Once you know what matters, the next step is to get everybody involved. Now that you have this list (you did do the exercise, didn’t you? ), let’s look at your projects. Whether you work for a 50 or 50,000-person company, a good rule of thumb is that 90% of your company’s employees are individual contributors. So if your company is doing well at this key, 4-½ of these ideas should come from front-line employees. Brave readers: comment on how well you did! Of the hundreds of attendees in my talks, how many had at least three ideas come from an individual contributor? None came from a company of more than ten people. Only about half had even one idea come from a front-line employee. I received a call from Conversocial on Monday. I downloaded a white paper entitled Who’s Ignoring Their Customers, and a fellow with a delightful English accent called from an international number to see if I was interested in their software. He emailed me the previous Friday, and since I didn’t respond within one business day, he made a follow-up call. I’ve been speaking quite a bit lately – four times in the last week and a half – so I haven’t been able to complete the second half of my blog post “Experiment Your Way to Growth.” But you can see me speak about it below. I come on at 2:44 into it. The second half should be out next week! Today is a special treat – a guest post from Annette of CX Journey. You should definitely subscribe to her blog – a great read! A customer experience strategy is just a strategy, a roadmap that outlines your approach to creating a customer-centric culture. Customer centricity is a way of life, a way of doing business, a journey. It’s not just a project or something to check off your “To Do” list for this week. It’s woven into the fabric of everything you do as an organization. It takes the entire organization to successfully execute a customer experience strategy, not just the executive team, not just the frontline, and not just the CCO and her team overseeing the strategy. High-growth companies discover their opportunities differently. They certainly use strategic planning and analytics, as do most of their competitors. But at their core, they do something else. Babson Executive Education asked companies their top method to find revenue or cost savings opportunities, then compared that to their growth rates. 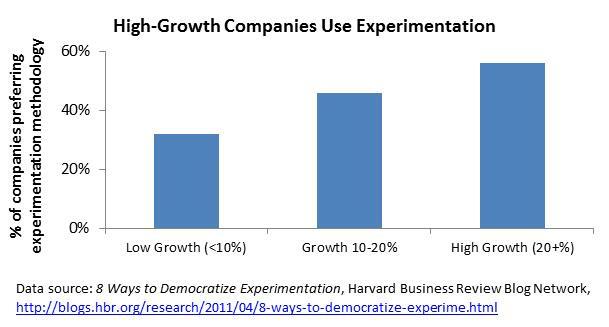 Whereas low-growth companies tended to favor analytics or strategic planning, over half of high-growth companies focused on experimentation, as shown in the chart on the right. Who Creates Your Customer Experience? Most companies are structured as if the 5% of the workforce at corporate knows more than the 95% who actually talks to the customers. Of course they don’t articulate that. But look at the last twenty changes to your customer experience. Were nineteen generated directly from the field? Or was it closer to one? 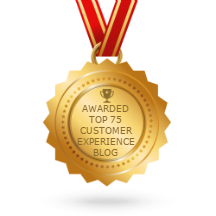 You certainly believe in listening to the customer (or you wouldn’t be reading a blog called “Heart of the Customer!”). But do you have a structured methodology to collect ideas from the field, deliberately test them, and then roll them out? Or do you have the equivalent to the often-ignored suggestion box? In 2006, when High-Definition TVs were just becoming popular, Best Buy had a problem. Accelerating HDTV sales drove significant growth. But underlying this growth was a huge issue with increasing levels of returns. Customers plugged their new $2,000 TV into their existing $20/month cable hookup, and the resulting picture looked terrible. While the Best Buy associates generally told shoppers about the need to upgrade to high-definition cable, most didn’t listen. So when their picture looked awful, they returned their TV. https://heartofthecustomer.com/wp-content/uploads/2015/01/hotc-logo.png 0 0 Jim Tincher https://heartofthecustomer.com/wp-content/uploads/2015/01/hotc-logo.png Jim Tincher2012-04-09 14:12:182012-04-09 14:12:18Who Creates Your Customer Experience? “At every level in the organization, if people don’t understand what’s going on face-to-face with the customer, it doesn’t matter what else you’re doing.” That’s the advice of Rhoda Olsen, CEO of Great Clips. It’s the same strategy that has driven 30 straight quarters of same-salon revenue growth. But it wasn’t always that way. Back in 2005, “We thought we were a pretty customer-focused organization, as everyone does,” says Olsen. But that year sales and customers dipped for the first time in history. This wake-up call showed Great Clips they needed to better understand the current state of their customer needs. After conducting significant research, they discovered their brand wasn’t very well-defined and category confusion was significant. Customers had a difficult time distinguishing Great Clips’ value proposition from other salons. Read more the full interview, including an analysis of efforts, in Great Clips – Driving Organic Growth through Customer Focus Interview with CEO Rhoda Olsen. Service recovery is critical for any business. Of course, the best time to fix a problem is immediately following its occurrence, but this is not always possible. How do you handle service recovery after the fact, when complaints come from the web, email, or a call? Let’s look at two very different examples, each based off of previous posts.